OK, you bought a cute feather tree for Christmas and now it's in storage for a year. Well, ... why not use it for Easter, too?! It makes a perfect "egg tree" for all your keepsake Easter egg ornaments. 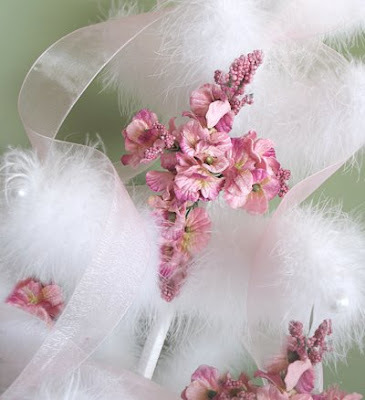 To make the cross: Use small silk flowers with a couple inches of wired stem attached. Twist the stems together into four 'arms' of a cross. Then, wire the four pieces together to form the cross shape. Add a small ribbon for hanging. Accent the tree with wide sheer coordinating ribbon. It was certainly interesting for me to read this article. Thanx for it. I like such topics and anything that is connected to this matter. I definitely want to read a bit more soon. Pretty interesting place you've got here. Thank you for it. I like such themes and anything that is connected to this matter. I would like to read more on that blog soon.